Recreational Vehicles Market size was valued at over USD 36 billion in 2017 and is estimated to exhibit at 6% CAGR from 2018 to 2024. Rising recreational spending across the globe will boost recreational vehicles market over study timeframe. Rapid urbanization and easy finance availability are positively influencing vehicle demand. The government entities are providing recreational facilities such as state parks to support healthy living. As per the U.S. Recreation, in 2018, there are over 400 national and 10,000 state parks for activities including camping, fishing and hunting. Growing number of facilities will accelerate industry growth. In November 2016, National Tourism Administration of China (CNTA) in conjunction with 10 other government organizations announced the development of 200 campgrounds to boost the national tourism. Other economies that include South Korea, Japan, Canada, the U.S., and some economies in Latin America are expected to witness significant investments for the development of recreational vehicle parks to improve tourist attractions. This is expected to positively impact the recreational vehicles market landscape. Rental industry participants are offering significant number of services to improve the client convenience such as sharing payments, accident insurance, 24-hour roadside assistance, low priced availability. Moreover, pre-booking rates of RV for a day can be availed at costs less than USD 10 per day. This has led to significant increase in the number of consumers opting for rental options. Thus, to cater the increasing rental demand, commercial players are expected to increasingly invest for their fleet expansion to cater the camping trailer and motorhomes demand which in turn will drive the overall regional market demands. 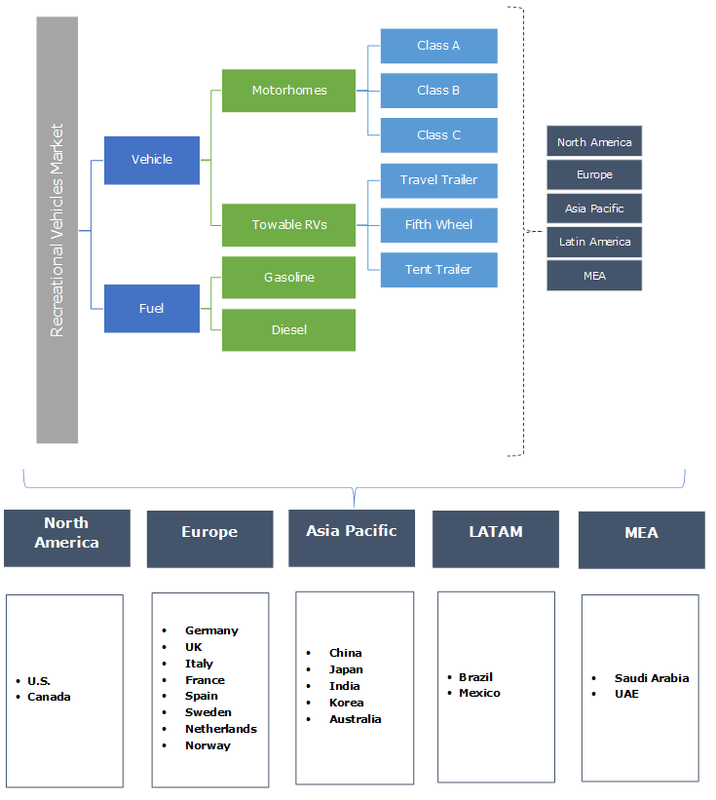 Increasing digitalization, shifting global population dynamics and rapid expansion in the global connectivity are the prime factor positively influencing the business growth. Moreover, industry participants are increasingly investing in the development of state-of-the-art interiors, weather-proof construction, robust material mixes, in turn driving the overall material costs at considerable rates. Growing RV sales every year is expected to present strong growth prospects for the interiors and related products such as laminated panels and cabinets over the forecast years. In 2017, Motorhomes accounted for over 50% of the overall recreational vehicles market revenue share owing to higher luxury and convenience. The vehicle provides more storage, living space and do not require separate carrier. Industry participants are enhancing their manufacturing capabilities to meet previous backlogs. For instance, in July 2017, Thor Industries had backlog of over USD 915,000. Increasing production to meet rising vehicle demand will propel segment growth over the forecast period. Class A motorhomes have significant share as it can accommodate around 7-10 people and have luxurious amenities such as master bedroom, well-equipped kitchen and bathroom facilities. However, high vehicle cost will limit its dominance in next six years. Class B motorhomes will foresee strong growth with better fuel efficiency and easy parking facility. Further, advancement such as digital thermostat, extra shelving and extra battery capacity will support segment growth. Towable RVs market share will witness over 6% CAGR in next six years owing to lightweight and sturdy construction. Industry players are continuously upgrading their product portfolio to attract more consumers. For instance, in April 2018, Airstream launched travel trailers with advanced technologies including Bluetooth controlled lighting, multiple USB ports and 3-D laminated galley top to enhance consumer experience. The towable RVs are more economical and require less maintenance cost. However, traffic regulations regarding towing capacity of a specific vehicle will restrict the product demand. In 2017, gasoline recreational vehicles market size was valued at over USD 23 billion owing to economical cost and less maintenance. The gas run RVs have high compression ratio and performs better in cold weather and high altitude. The vehicles generate higher power and offer superior speed control on hilly terrains. Further, countries are strengthening their fuel distribution infrastructure to support automobile industry. As per Canadian Fuels Association, in 2017, the number of fuel outlets rose to 11,948 as compared to 11,873 in 2016. Continuous growth in gasoline dispensers will positively influence the product demand over the study timeframe. Diesel segment will witness significant growth owing to higher fuel efficiency. Diesel fuel offers greater energy density that reduces fuel consumption. The vehicles have rear engine configuration that limits cabin noise and enhances cooling efficiency. Ongoing vehicle upgradation such as air ride suspension and air brakes have increased vehicle safety. However, high maintenance cost will limit segment growth in next six years. 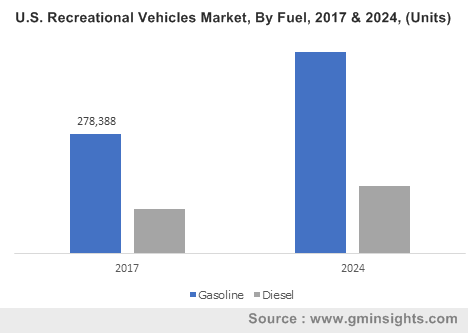 North America will account for approximately 60% recreational vehicles market share by 2024 with presence of major manufacturer, distributor, and exporter such as Thor Industries, Winnebago Industries, Forest River Inc., and REV Recreation Group. The U.S. is largest manufacturer of recreational vehicle across the globe and produces as many as the rest of the world combined. The country has around 60 RV and over 200 component manufacturers with over 80% vehicles being manufactured in Indiana. The manufacturers are increasing their manufacturing capability to improve economies of scale thereby escalating industry growth. Asia Pacific will witness significant growth with growing disposable income of the middle-class population and increasing government support for the development of tourism in the region. Australia is the largest RV market across the region. According to Caravan Industry Association of Australia (CIAA), the camping industry contributes over USD 13.5 billion annual to national economy. Moreover, industry participants in the region have witnessed consistent increase in the demands over past few years. Growing adoption of RVs will present positive outlook for the industry participants over the forecast period. Major recreational vehicles market players include Thor Industries, Winnebago Industries, Forest River Inc., and REV Recreation Group. Other significant players include Airstream, Bison RV center, Crossroads RV, Cruiser RV, DRV Luxuty Suites, Dutchmen RV, Erwin Hymer, Fleetwood Corporation, GMC Motorhome, Grand Desigh RV, Highland Ridge, Kropf Industries, Keystone RV, Skyline Corporation, and Pleasure-Way Industries. Industry participants are introducing new models with advanced technology to enhance consumer experience. In September 2017, Winnebago announced the launch new recreational vehicles including the Revel, Horizon and Intent, to the motorhome line-up. The company introduced a new line of Minnie Plus Fifth Wheels in towable portfolio. Recreational vehicle industry covers the motorized and non-motorized vehicles adopted for leisure activities including camping, hunting and fishing. Government initiatives including carbon emission limits is resulting in higher needs for energy-efficient transportation. This has enabled industry participants to invest in innovative materials for manufacturing RVs with weight considerations and increasing efficiency. The development of electric powertrain for recreational vehicles with reduced carbon emissions and enhanced efficiency will positively influence the business expansion till 2024.